Ive seen things you people wouldnt believe. Attack ships on fire off the shoulder of Orion. I watched C-beams glitter in the dark near the Tannhäuser Gate. All those moments will be lost in time, like tearsinrain. Time to die. I guess you can call this script reimagine a part of what Roy Batty has seen in his final monologue, in a fashion of terminal. Numerous explosions everywhere. cbeams was created by Jonathan Hartley on 2015-10-04, written in Python 3 with Blessings under the New BSD License (3-clause), currently version 1.0.0rc3 (2016-01-07). Cmas is a tiny Christmas tree with red and blue light bulbs blinking alternatively. Dont want to buy a tree for Christmas, this would do. Maybe. Cmas was created by Taylor Hoff, written in C++ under the GPLv3, currently git-08d594c (2015-05-31, post v1.0 (2015-05-26)). mandelbrot-viewer is a simple and interactive viewer, you can zoom in and out with + and -. The GIF screencast is of course sped up, somehow, it looks like something has been locked and the system is tracking down the subject like in sci-fi movie. mandelbrot-viewer is written by David Ulrich in C with ncurses under the AGPLv3, based on Ken Perlins code snippet, currently git-a3f2762 (2015-10-30). 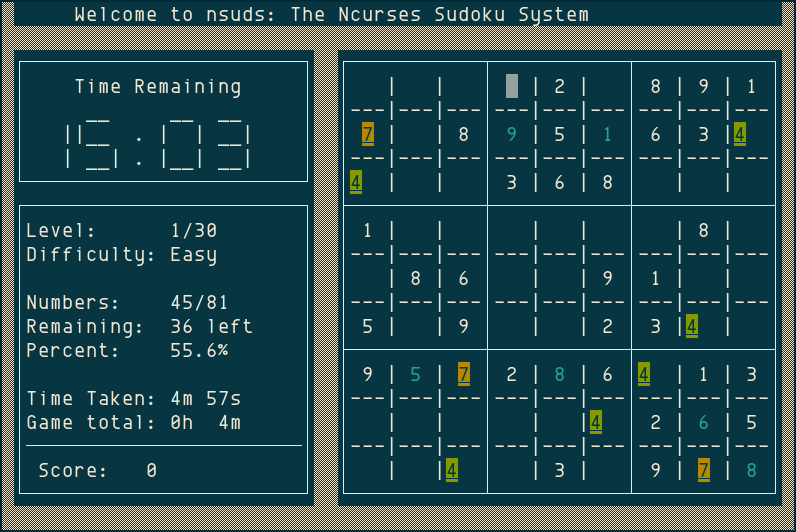 The Ncurses Sudoku System is a Sudoku clone, and it looks like it means business, the interface looks as if its for system configuration. CLines is a Color Lines clone in console. 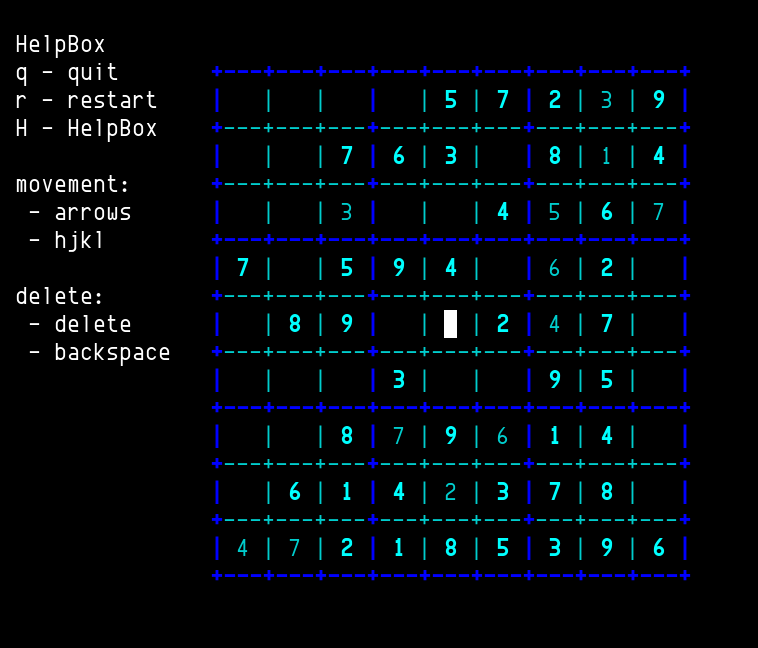 You use hjkl to move and Space to pick up chip and replace it somewhere else, or you can use mouse to click. The board resizes to fit into terminal size as best as it can, you can see in this video. Its a simple puzzle game to play, all you do is to line up at least five chips of the same color in a straight line, horizontal, vertical, or diagonal, one of them will do. But if you cant form a line after each move, three more random chips will be placed. When I first played, I thought you can only move a chip in a straight line, that is only go in one direction, didnt realize as long as the path is clear, you can move a chip to anywhere. I hardly got past 40 points, it was hard. I almost nicknamed this game as Cussing Lines. CLines was created in 2002 by Pawel S. Veselov, written in C with ncurses under the GPLv2, currently git-410ae26 (2015-11-11, post v1.0.5 (2015-06-19)). freecell is a clone of FreeCell. 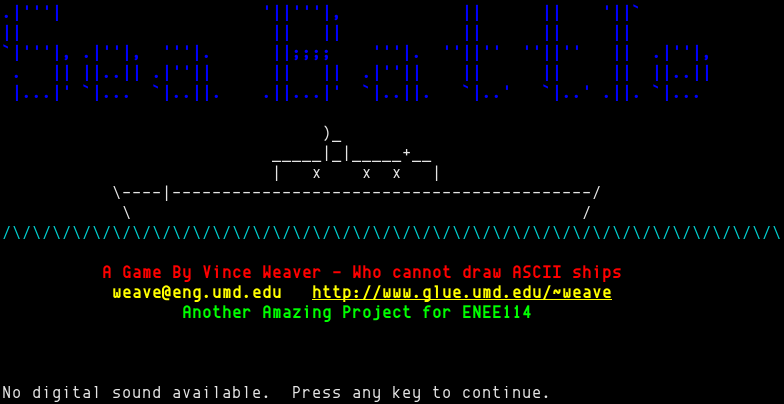 You can choose the game by specifying the number in command-line argument. The controls use A to H for eight cascades, and W to Z for four open cells. You can move a stack between cascades by preceding the source cascade with the number of cards first. Moon-Buggy is side-scrolling run-and-gun (or jump-and-gun?) 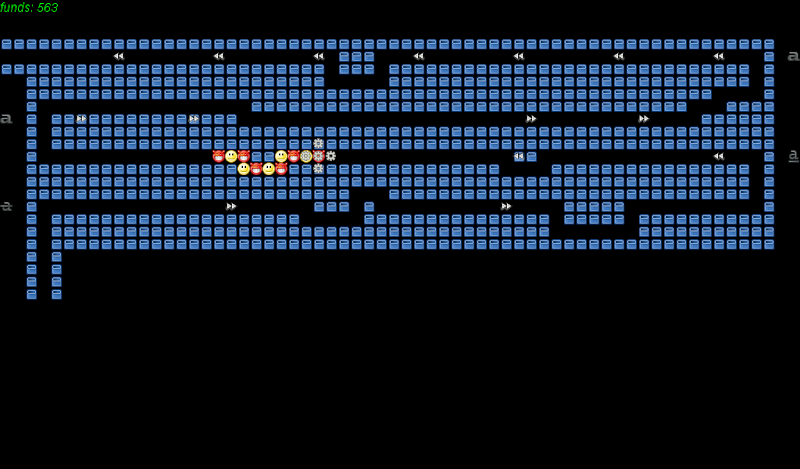 platform game which you control a moon buggy trying to traverse the terrain of the moon. You dont drive, just jump and shoot. Moon-Buggy in action, and also a video. You will encounter craters, from tiny to big ones, the bigger crater you can jump over, the higher score you earn. It has 8 levels. The moon buggy is also equipped with laser beam, that you can destroy meteors if they block your buggy way, which they do, each requires 3 strikes of laser beams. Firing laser beam costs one point of score, but if you hit on a meteor, you earn more scores back. It really is a fun game, especially you can share high scores among users, a little competition would be nice. By the way, you can jump-shooting, although I dont know what the purpose is, maybe hostile UFO? The animations are stunning, details, details. The wheel spinning, the laser hitting the rock to disintegrate into nothing, and my favorite, crashing, parts broken and being thrown out into the air, curving down and hitting the ground, then rolling. Moon-Buggy was created by Jochen Voss on 1998-12-17, written in C with ncurses under the GPLv3, currently git-e4b97c9 (2015-05-30, post v1.0.51 (2006-03-19)).